One of my signature images, which was used to launch the blog, Niagara depicts how a unique composition can be extraordinarily powerful. 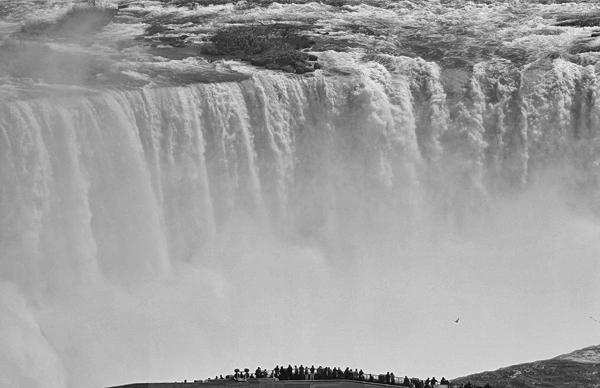 The line of tourists on the bottom of the image were in Canada viewing the thundering falls in New York. The flying bird to their right was a (purposely) added bonus. The composition of a photograph is just as important as the lighting, sometimes even more so. As can be seen from this image, as well as my last post (you can always click on the Blog Title to view all images), the photographic rules of composition were made to be broken. When I create an image I compose it according to what I feel about what is in front of me. The juxtaposition of the main subject, to the background and to anything else I choose to include. There needs to be a complete balance within the frame, every part of the image has to contribute to the whole picture, so to speak. Often, this involves a great deal of negative space. If used improperly the image will seem imbalanced. When done right, you can create something unique, an image that goes against long standing photographic teachings, that violates the rule of thirds and often results in something very special. Sometimes I will shoot a scene utilizing varying compositions, the best of which is not always readily apparent in the viewfinder or LCD screen. Then, when editing the images, the most impactful composition becomes clear and it is usually the first one I saw which was also the most extreme variation from the norm. So, the moral of the story is shoot from your heart, not your head. Experiment and disregard the traditional rules. Done right, you just might create and unexpectedly, powerful image.